I won't be modest, these brownies are the best! They are moist, chocolatey and chewy and no one will ever guess that something gluten-free can taste this fantastic. The good news is they are really easy to make - just follow the tips at the bottom of the recipe. Pre-heat the oven to 170ºC (325ºF) Gas 3. Line a 22 cm (8½ in) square tin with a large square of foil. (You can also use a disposable square tin measuring about the same, and just brush lightly with a little sunflower oil.) Make sure the corners are carefully lined. Using a pastry brush, lightly grease the foil with a very small amount of sunflower oil, making sure the corners are well greased. Melt the chocolate and butter in a double boiler or a bowl set over a pan of simmering water (you can also use a microwave), taking care the chocolate does not overheat. Stir the mixture. It should look very shiny and glossy. Remove from the heat and add the sugars and stir through allowing the sugar to dissolve a bit. The mixture may look a bit grainy at this stage but this is completely normal. Add the eggs, beating well and once again the mixture will be thick and glossy. Add the salt and vanilla and then fold in the ground almonds and finally the chopped marshmallows and toasted pecans, if using. Make sure everything is well incorporated but do not overmix (you do not want lots of air in the mixture). The mixture will be quite thick and reluctant to pour. Spread the mixture into the prepared tin to form an even layer. Bake for approximately 20–25 minutes or until it is just set in the middle and the edges are slightly coming away from the pan. A wooden skewer inserted in the middle should come out with just a few moist crumbs on it. If it is totally gooey, place back in the oven to bake for a few more minutes. This will not harm the brownies so check them as often as required. Once they are done, leave them to cool completely in the tin before cutting them. To serve, invert the pan and then very gently peel off the foil. (If you are using a disposable tin, just press the edges of the pan to loosen the brownie a bit, invert the tin and carefully peel the tin away from the base. It should peel away easily). Place the brownies on a board and using a sharp knife, cut into squares and dust with icing sugar. Do not overmix the batter. You don’t want lots of air in the mixture. Always make brownies in a square pan. Don’t overbake but also don’t underbake! Insert a wooden toothpick in the centre. There should be a few moist crumbs when you remove it. The edges should just slightly be pulling away from the pan. I baked these and they were really easy, all my family ate them with no complaints! 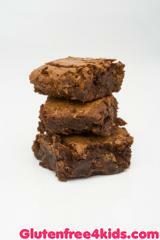 Made these and they are absolutely fabulous - best brownies I have ever made (or tasted!) I wonder, however, if there is a knack to cutting marshmallows into pieces? I started with a sharp knife but very quickly moved on to using kitchen scissors - but oh what a mess I got into. The pieces of marshallow began sticking to the scissors, sticking to my fingers and sticking to each other in big lumps. The more I tried to separate them the more they did their own thing and stuck everywhere. Is there a secret method or tip for doing this an easy way so I don't end up with what looks like pink and white snowflakes stuck everywhere but where I want them? Or could I use small marshmallows without spoiling the (heavenly) end result? I would be grateful for advice on this. Thanks for your comments and for raising the sticky issue of how to cut marshmallows. I too use a pair of scissors to cut them up. I usually cut them into bite size chunks so perhaps not as many small pieces as you describe and yes they can stick to everything. My secret is just to dust them with the ground almonds as I am cutting them. They do tend to clump together when you place them in the chocolate mixture, but as long as they are broadly distributed there isn't much harm in this. I avoid the small little marshmallows as I find they are pretty tasteless and also they can go hard and bullet like when baked. If you are in the United States or somewhere where American products are sold, you can use the mini marshmallows made by Kraft Foods. These melt down beautifully and avoid you having to go through the hassle of cutting them. If you can't get hold of the mini marshmallows, a neat trick is to put the marshmallows into the ground almonds, then dip the scissor blades in the ground almonds, pick up a marshmallow and snip it into smaller pieces. You will just need to keep dipping the blades in the ground almonds as you chop each one and the job is done in no time. These are just so yummy - already baked them twice in less than a week! When you say "ground almonds" do you mean almond butter? Ground almonds are almonds which have been ground finely into a flour. If you take this process too far you end up with almond butter- which is very tasty. I've not tried making these brownines with almond butter but now that you've put the thought in my head, it sounds rather nice. Oh, almond flour! Ha. I actually did use almond butter and if you bake for about 40-45 minutes they are really tasty. I have never heard almond flour being referred to as just ground almonds in a recipe online before.